I have always been a person that can replicate art. Maybe not always come up with my own but when I see something I like, I say to myself “I can do that” and then I start to work breaking it down to figure out how to do it. Painting, sewing, pottery, culinary arts…. Anything “fartsy“. 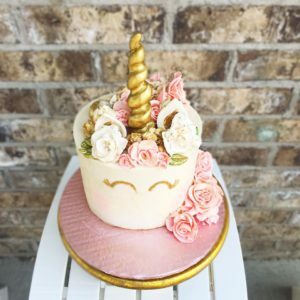 When I started having kids over a decade ago, I saw these really cute cakes that I wanted for their birthdays but at the time couldn’t afford what it cost to have one, so I said to myself “I can do that”. I started playing around and teaching myself by trial and error and learning what I could from the Internet. (Oddly enough this was before Pinterest) It was when I was employed in an office job a few years later that I found myself daydreaming more about food, desserts, cakes and experimenting with food then I did actually billing millions of dollars to corporate businesses. That is when I said, “it’s time to change jobs”. So I quit my job and became a baker at the cake shop, One Sweet Slice, making about 1/3 of what I had been previously. But if it made me happy and feel fulfilled then it would be worth it. I finally loved my job which had honestly never happened before. I quickly began learning how to bake cake, cupcakes, eclairs, brownies, tarts and and more importantly started decorating cakes. Quickly I moved up to manager within a few short months and felt the universe was taking taking care of me because I had decided to follow my bliss. I learned so much during the following year that when One Sweet Slice decided to close in 2015, I didn’t want to give up baking and cakes just yet. Along with my assistant manager, we decided to venture into our own cake business. Success!!! I moved my dining table into the living room and filled the entire dinning space of my very tiny apartment with cupcake/cake pans, baking supplies and Rockstar Cakery was born. People often ask me how we came up with the name. Two reasons. One was Amanda and I lived off of Rockstar energy drinks during our time at One Sweet Slice and thereafter because we both had full time jobs and starting the business. And the second was one of the owners, Janell, of One Sweet Slice always called us ‘rockstars’. It kinda stuck with us, and being the sentimental softies we were, we went with it. After baking and cupcaking for some time, Amanda decided to move on and focus on her family. Deep down I wanted to see how far this “cake thing” would take me. It has been a wild and amazing ride. Every month calls keep coming in for cakes or cupcakes and my experience grows. While it has been slow sometimes getting the business going as far as marketing (I worked full time for another company and had three little boys) I haven’t given up and its beginning to truly pay off. 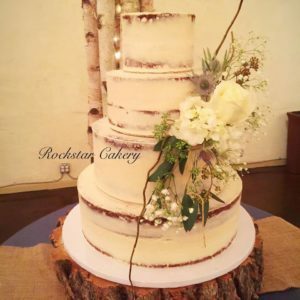 Rockstar Cakery is now a preferred vendor for multiple high-end client in the Salt Lake Valley and have been feature in local wedding magazines. I have been able to quit my full time job and dedicate myself solely to cakes (HUGE SUCCESS for me!!). Opening my cakery has been the scariest, hardest, most thrilling and challenging thing I have ever done (I am not a risk taker AT ALL) but I keep taking one step at a time, trusting that it’s a forward step, and making sure to stop every once in a while and look at where I am so I can enjoy the view. That is what currently keeps me going and I’ll keep going with it until I see something else and say “I can do that”. I am now my own cake shop baker :). 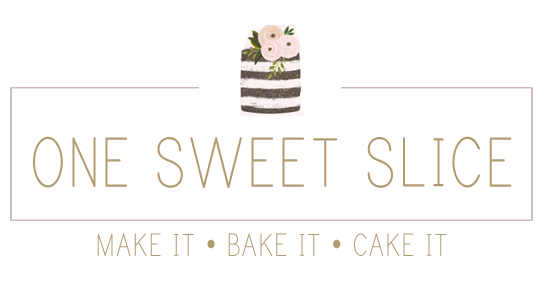 To spotlight your cake shop, please submit your contact information here. I started baking while taking a cooking class in high school and instantly fell in love with baking cupcakes and cooking. Baking and cooking for my friends became a passion. After high school I started making cakes, cupcakes and other desserts as a hobby. My twin sister, Angela, told me I should get into cupcakes and open a cupcake bakery because they were a big thing. So 8 years ago my twin sister and I started a cupcake bakery home business from my small condo ‘Cravings Alisha’s and Angies Cupcakes’. Our motto was “You imagine it, we’ll create it”. Baking cake and cupcakes began to be an addiction. Creating new flavors and trying to get the best consistency. After a few months Angela got too busy and didn’t want to be part of the business anymore so then it became Cravings – Alisha’s Cupcakes. At the time I was a server, bartender, and trying to get into management with Chili’s bar and grill. I continued to make cupcakes on the side but it started to grow and I realized I did not want to be a manager for a corporate company but to instead own and operate my own cupcake bakery. Cupcake Wars aired and my friend told me I should apply. I watched one episode of the season 1 and said “NO WAY! I could never go on that show”. Season 2 came around and my friend again told me to apply. I thought, “what the heck, I won’t get chosen but I might as well submit an application”. My resume was emailed and the next day Food Network called, they asked if we would make an audition video. I was in shock! We made the audition video and that week they said they wanted us on season 3 of Cupcake Wars! Well long story short my twin sister and I went…lost in the first round, had no idea what we were getting ourselves into! Right after we told ourselves we would NEVER do that again. 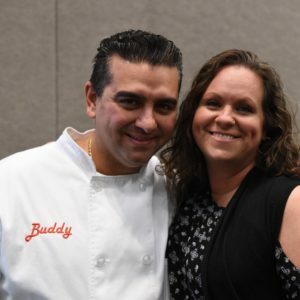 Season 7 came around and Food Network asked us if we would be on a redemption episode…instantly I said yes! What was I thinking? This time we were going to be extra prepared. We drove down to California with my family and we won!!!!!! My husband, Dave, is not an entrepreneur by heart and never wanted to own a business but I told him if we win he had to promise that we will open up a cake shop! Well we did! On November 8th, 2012 we opened Cravings Alisha’s Cupcakes in Pleasant Grove, Utah. I’m living a dream! My son asked me recently, “if you could work anywhere you wanted, besides being a baker, what would it be?”, I looked at him and said, “nothing, I love my job so much, I can’t imagine doing anything else.” Truly I am so blessed I get to work and do what I love. Our small town cupcake bakery specializes in cupcakes, cakes and baking parties. I like to consider our cupcakes as mini gourmet desserts! It’s not just cake and frosting. Love goes into each flavor! 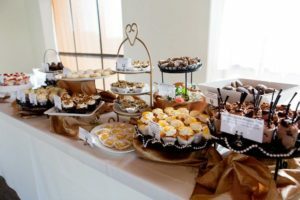 Our menu has expanded to cookies, bars, brownies, cakes, and many many other desserts! We still have the motto “you imagine it…we’ll create it”. We do pies and rolls for Thanksgiving. Our gluten-free menu has blown up and we have many gluten-free customers. For awhile we were thinking about expanding…and then some friends that owned a bakery called “One Sweet Slice” talked us into reality and I realized I loved my life and did not want another shop so we decided to have a baby instead, ha ha. (You don’t have to put this in, I just think it’s funny that really after talking to you guys it changed my mind and was the best decision!) Maybe in the future we will expand but for now we love our one little shop here in Pleasant Grove, Utah and are happy where we are. 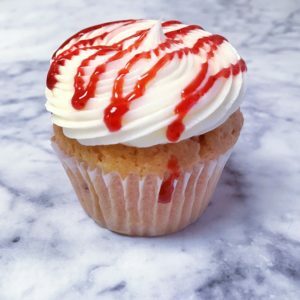 To spotlight your cupcake bakery, please submit your contact information here. Cake Bakery Owner | Winner of Cupcake Wars! I’m an industrial Engineer by trade and after years of working for corporate America I started to bake as a creative outlet. 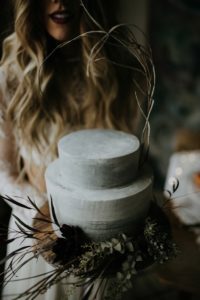 I was blown away by the variety of designs, techniques and flavors that were being implemented and created by so many talented decorators and bakers. The idea of opening a cake bakery wasn’t even a thought at that time. I began baking with a variation of the classic Dominican pound cake but I started adding other ingredients and fruits that were not common where I live in Pennsylvania. One thing led to another and soon I was immersed in online communities for cake decorating and baking. 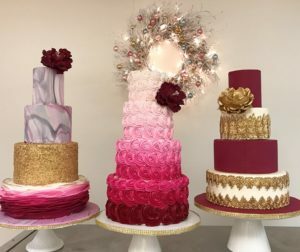 I took as many classes as possible to learn from experienced cake artists and attended different cake shows to learn more about the industry. As my passion grew I decided to go full time into the cake and cupcake business! In 2007 I rented a small commercial bakery space in my town and Ady Cakes was born. 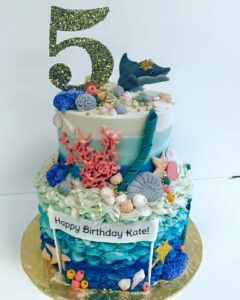 My absolute favorite part of owning a cake bakery is the creative aspects of it! No day is like the other as I’m faced with different challenges: dealing with employees/clients, creating cake recipes, developing decorating techniques and inventing new cake designs. Failures were part of the learning process but overcoming them and learning new life lessons has made the whole experience worth it. After winning the Food Network show Cupcake Wars in 2012 I decided it was time to publish my recipe book. I collected my best recipes and submitted a rough manuscript to several publishing companies. 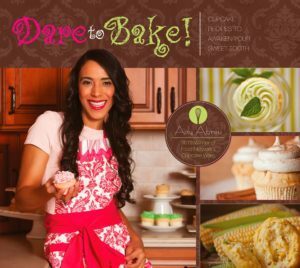 In little time, I heard back and my recipe book “Dare to Bake!” hit the bookshelves in March 2014. The book is being sold in major book retailers such as Barns & Noble, also at Walmart.com and Amazon. To spotlight your cake bakery, please submit your contract information here.